Gary Kubiak walks a thin line between present and future QBs. Here's how he can succeed at it. Head coach Gary Kubiak doesn't need to making sweeping changes to his passing game yet. Benching Peyton Manning is extreme. He might find it easier to install a “Brock Osweiler” package — a handful of plays tailor-made for the Broncos' backup passer. Manning currently sports a worse passer rating than Jameis Winston. He's on pace to throw fewer than 20 touchdowns for the first time in his storied 18-year career. It's not easy to simply pull the plug on a future Hall of Famer. 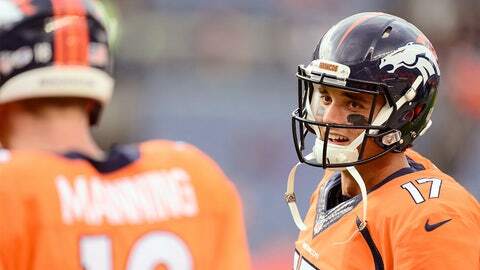 A call for Osweiler would be in line-step with what Kubiak planned to do from Day 1. Then, Kubiak could dig into more deeper passing elements of his playbook, rest his soon-to-be 40 year old starter, and evaluate Osweiler in meaningful game situations. The latter point is of upmost importance. Osweiler hits the free-agent market this spring and the Broncos don't know if he's a rightful heir. There's only one way to find out. Usher in the Osweiler era, slowly but surely.